Thinking of going prop-less in the booth? The photo booth props- the hats, glasses, wigs or whatever you might choose, will definitely help create some fun pictures and a lot of laughs. Then again, it can be just entertaining when you strip off those props and strike a pose! Whether on your own or with a group, if you’ve got a little creativity and a plan, you’re bound to produce a few photo strips worth hanging on the fridge. One of our favorite recent photos (left) was taken at Eastern Michigan University’s Winter-Fest celebration. Beyond being impressed that he finished making the balloon dog in four shots, we can definitely say that this strip is one of a kind! The picture on the right we found on Pinterest (where else!) of this super creative couple and we love their idea! If you don’t make balloon animals, or have another photo strip to walk into, we have a few ideas for you for the next time you’re in a Snapfuze booth. The first is super simple. 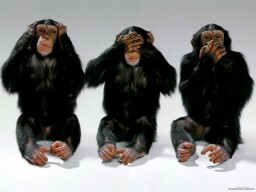 For the second, think three wise monkeys. Pose Four: Either go with the fourth wise monkey and Do no evil (crossed arms), or give a good guilty smile, like you got caught doing wrong, to imply you have not learned from the wise little monkeys. Why not pose in the photo booth to emulate some of your favorite pieces? 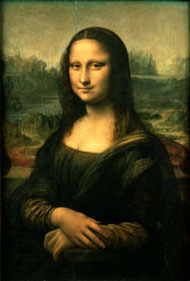 Da Vinci’s Mona Lisa – Decide for yourself whether or not she’s smiling. Why not go on an imaginary roller coaster ride! Some of the funniest pictures, second only to photobooth pics, are those that are taken on amusement park rides. Combine the two and you can’t go wrong! Shot One: Hold that make-believe handle bar as you come up over the first big hill. Let your face show whatever excitement or terror you might feel! Shot Two: Throw your arms up and scream! There are tons of poses you could choose from! Throw your arms up like your team just scored a field goal, or give some of your best touchdown dance moves. Say a quick prayer of thanks like Tim Tebow, or give your best Heisman stance. Point way out to the outfield before you hit that homerun, call a runner safe on base, or line up for the wave. Prefer Basketball? Let your hand hang in the air as you watch that three-pointer sink in, nothing but net. If you float like a butterfly and sting like a bee, show your best uppercut, bolo, or whatever might get you that k.o. Dougie. If you know the choreography to Beyonce’s “Put a Ring on It”, then go for it! Or, even something cheezy like the YMCA or the Chicken Dance. Do the Hustle, the Macarena, or Vogue. Even if you don’t want it played at your event doesn’t mean you can’t have fun with it. There are limitless possibilities to poses you can work into the four shots that make up each strip. You can simply choose different expressions- showing your angry, confident, scared, excited, happy, guilty, flirty, sad, tough, crazy, silly, or kissing face. Or you can let your creativity run wild. Either way you will have a great time and leave with some awesome pictures! What are some of the best poses you have tried? Or, do you have some great ideas for some you haven’t yet had the chance to try? Let us know!